Australian researchers have developed a banana rich in pro-vitamin A to help address nutrition deficiencies. It is estimated that 650, 000 – 700, 0000 children worldwide die from pro-vitamin A deficiency every year. Several hundred thousand others go blind. The result of a decade-long research project conducted at Queensland University of Technology, the genetically modified banana was created by identifying and selecting genres to enhance the pro-vitamin A content. The project was funded with close to $10 million dollars from The Bill and Melinda Gates Foundation and ultimately aims to improve the nutritional content of bananas in Uganda where the fruit is a diet staple. 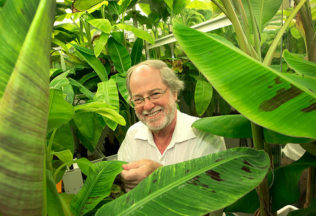 Professor James Dale, lead researcher for the project, said creating the banana was a significant humanitarian project. “What we’ve done is take a gene from a banana that originated in Papua New Guinea and is naturally very high in pro-vitamin A but has small bunches, and inserted it into a Cavendish banana,” Professor Dale said. “Over the years, we’ve been able to develop a banana that has achieved excellent pro-vitamin A levels, hence the golden-orange rather than cream-coloured flesh,” he said. An article on the banana has been published in volume 15, issue 4 of the Plant Biotechnology Journal.